Hang Castle is the eleventh stage in Sonic Heroes. The spooky fortress is truly one of the most bizarre levels in the game; invisible walkways, levitating platforms, pumpkin-headed ghosts... and most bizarrely of all, a flagrant disregard for the direction of gravity, with mysterious switches that turn the world upside down. When activated, the characters will fall upwards to walk on the ceiling, and the music changes too. After a battle with Team Dark, Team Sonic enters the spooky castle. Knuckles then starts to tease Tails saying that it could have been Shadow's ghost they saw earlier. Meanwhile, Shadow is wondering about his true identity, and who exactly was that blue hedgehog he saw earlier? With Team Rose, Big and Cream are having second thoughts about entering the scary castle. But Amy encourages them to think about Froggy and Chocola. Meanwhile, Team Chaotix is feeling embarrassed for the misunderstanding they had with Team Rose in Team Battle 2. Vector and Charmy start arguing until their client sets them straight and tells them to be on guard, as "it's very mysterious around here!". 45,000 40,000 35,000 30,000 <30,000 Infiltrate the mysterious castle! 65,000 60,000 55,000 45,000 <45,000 Enter the spooky castle! 45,000 40,000 35,000 30,000 <30,000 Find the haunted castle! 35,000 30,000 25,000 20,000 <20,000 Get the 10 keys inside the haunted castle! 45,000 43,000 40,000 38,000 <38,000 Get to the Goal Ring within 6 minutes! 23,000 20,000 18,000 15,000 <15,000 Collect the keys without being detected by the enemies! The Eggman / Neo Metal Sonic statue. 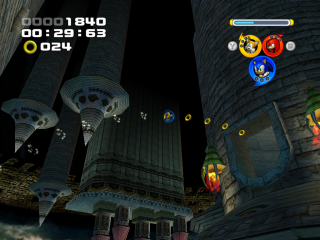 Midway through the level is a large statue of Eggman affixed to a castle wall. When the gravity switch is hit, the underside of the statue flips to reveal a Neo Metal Sonic statue hiding underneath. Hacking reveals that the gravity inversion switches are actually teleporters, transporting the characters to a completely different part of the level, but constructed so it looks like an upside-down version of where the Teams were before. This is the only level in Sonic Heroes to have two musical tracks: one for when the castle is right-side up and another one for when it's upside down.